Nick De La Cruz of Davenport practices for this year’s Texas 4000 for Cancer fundraising bike ride, for which he organized the Pacific Coast leg. When Nick De La Cruz was at Davenport Central High School, he helped found the Marshall Maniacs, a crew of students who enthusiastically support the Blue Devils basketball teams. As a May graduate of the University of Texas, De La Cruz will, beginning tomorrow, bike 4,500 miles from Austin to Anchorage, Alaska. It’s the seventh year of the Texas 4000 for Cancer event, and De La Cruz is front and center as part of the program. 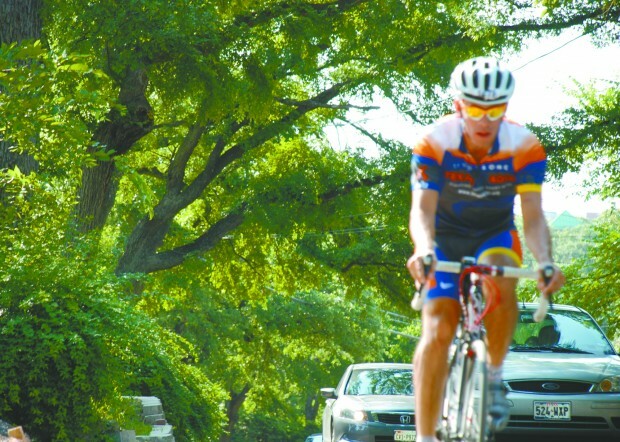 Founded in 2004, the Texas 4000 is comprised of university students who tackle the longest annual charity bike ride in the world. Along the route — which winds among nine states and two Canadian provinces — they will educate others about cancer, share knowledge of prevention and early detection methods, and raise up to $350,000 for cancer research, as well as patient and family support initiatives. De La Cruz, 22, has been distance-riding since the eighth grade, when he took part in the Register’s Annual Great Bicycle Ride Across Iowa, or RAGBRAI. He’s travel chairman for the coastal route of the Texas 4000. “My job is to plan the entire 70-day trip, turn-by-turn directions, campsites, showers and everyday needs. That includes even little details, about like the location of the laundromats in British Columbia,” he explained. De La Cruz and his best friend, Tom Walton, had just finished junior high school when Walton’s family decided to participate in that summer’s RAGBRAI. De La Cruz was invited to go along and eagerly accepted. “That’s what got me into cycling,” De La Cruz said, noting that he’s annually done RAGBRAI with the Waltons ever since. He’ll miss this year’s event, however, because of his involvement in the Texas 4000. De La Cruz looks at the Iowa ride as his annual spiritual renewal. “That’s how I came to know and love my home state,” he said, mentioning that his future plans are to return to Iowa and attend law school. Scott County Attorney Mike Walton, who is Tom’s father, said the family has come to really enjoy both the biking event and Nick’s participation in it. The Texas 4000 event is now partnered with the Livestrong organization, which is also based in Austin. De La Cruz appreciates the charitable purpose of the ride and that partnership. He is one of four children of Brenda De La Cruz of Davenport and Mike De La Cruz, who lives in Texas. His family has been affected deeply by cancer: His mother fought Hodgkin’s lymphoma as a 13-year-old and was declared cancer-free in 1983. One grandmother is a breast cancer survivor and the other grandmother had leukemia. Two of his great-grandparents also battled cancer. “This ride is a good reminder to Nick of how cancer has affected his own family,” Brenda said. Nick’s mother is not too worried about the task her son will face beginning Saturday, noting that he has demonstrated personal independence for years. De La Cruz is excited to begin the Texas 4000. It’s one of the reasons he went to college at Texas, he said. He was accepted to the 4000 team late in 2010 and spent a year gearing up for the trek. Each college student is allowed to do the event only once. “All the work is done by students, so you need about a year to prepare for this bike trip,” he explained. The 70 nights on the trip will be spent in prearranged locations, mainly campgrounds, churches and gymnasiums and, occasionally, with host families. De La Cruz chose the coastal route, as opposed to the Rockies route used by the other set of Texas 4000 riders. “I’ll be riding up the coastline, through the Napa Valley. What more could a person want?” he asked. Team members will gather in a circle at night, each mentioning the name of a person they ride for, such as one who has died from cancer or is battling cancer. Riders also will participate in programs devoted to the cancer mission: reaching out to hospitals, treatment centers and programs for children with the disease. De La Cruz graduated from Texas with a bachelor’s degree May 18. He’s on the Texas 4000 ride until Aug. 10, and then he travels back to Iowa the day after it ends. He’ll attend orientation at the University of Iowa Law School on Aug. 12. From that point, De La Cruz sees the sky as the limit. One possibility is to enter politics, he said, and maybe, someday, run for governor of Iowa.